Self confidence is known as a socio-psychological concept relating to a person’s self-assuredness on his personal judgment, ability and any other areas linked to himself and excessively manifesting it. A lot of people desire to build their own confidence because this is actually infectious. This means that if you are confident about yourself, then it will be easier for you to present yourself to the public without worrying about not being accepted. If you feel like you lack confidence, then rest assured that a self-confidence certification program is now introduced to the public to help people like you. Taking part in this program will let you know that there are factors that may affect the level of your confidence. These include your psychological health, physical health and appearance, self-worth, race, body weight, gender presentation and identity, discovery of sexuality, ethnicity and involvement in any physical activity. Increasing the level of your self-confidence is never impossible if you are just committed towards doing your part while taking up your self-confidence course. If you are serious about improving the level of your confidence, then it is also advisable for you to be willing to make some changes on the way you perceive things. Among the many things that you can do to instantly boost your confidence are create a list of all your achievements and go over them every time you think lowly of yourself, know your strengths, determine what really matters to you and what can make you happy, manage your mind to defeat negative self-talk, improve your posture and the way you dress, compliment other people for their achievements and learn to speak up. It is no longer a secret that having a higher level of self-confidence is a major help in achieving success. 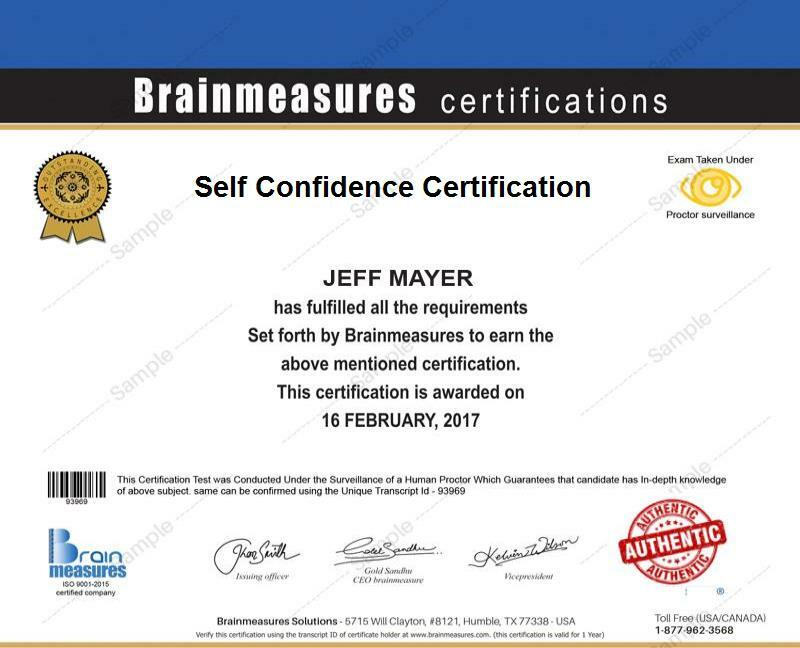 Brainmeasures recognizes the importance of improving a person’s confidence so its experts develop a self-confidence certification program designed to help anyone who wish to improve their personality. With the help of this program, you will be able to train yourself into thinking that you are a much better person than what you actually perceived. Since the self-confidence certification program offered by this ISO certified and reputable online certification company is developed by experts, you have a hundred percent guarantee that you will learn the basics of improving your personality at the fastest possible time. After completing the program, expect to emerge as an even better person. You will notice a great improvement in the way you communicate with others and the way you handle yourself in public. But it should be noted that the program is offered with a self-confidence exam which is primarily designed to assess your personality and your level of confidence. Brainmeasures will reward you with a self-confidence certificate if you successfully pass the test. Anyone who lacks confidence can enroll in the self-confidence certification program from Brainmeasures. This is perfect for anyone who wishes to improve his perspectives about life and enhance the way he handles himself. It is also perfect for anyone who desires to become an effective public speaker and anyone who gets a higher rank and bigger responsibilities in an organization. Completing the self-confidence certification course offered by Brainmeasures is a good way for you to improve your career. If you can show business owners that you are confident about your skills and knowledge, passionate, fearless, a good speaker and have excellent verbal and communication skills, then you are increasing your chances of becoming a formidable competitor in the employment industry. There is even a great possibility that you will receive high-ranking positions in an organization including managerial and directorial positions. Self confidence certification holders can expect to earn big especially if they were able to fill high-ranking organizational positions. If you can show the owners of an organization that you have a good personality and a high level of confidence, then expect them to entrust to you some of the biggest responsibilities and tasks. This translates to higher earnings, most probably more than the average.